What is the new "G Unit"!? 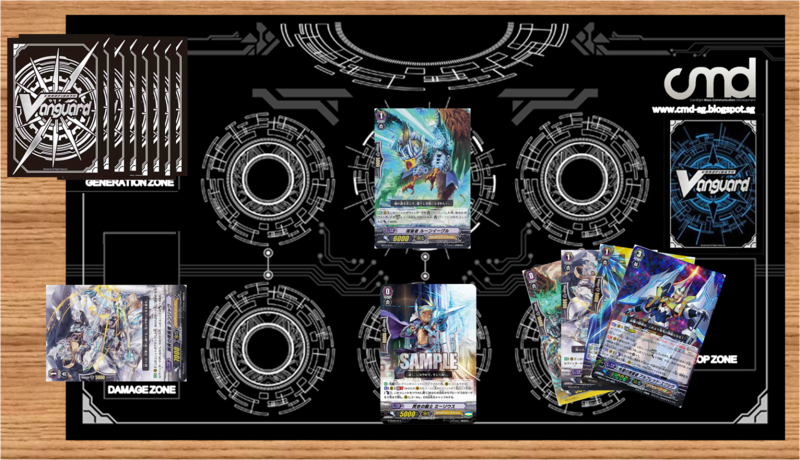 - G Units are a special type of card that are placed separately from your main deck, in the Guardian Zone (G Zone)! - Up to 8 G Units can be placed in the G Zone. Try it with "Harmonics Messiah"! - The Japanese edition of "Harmonics Messiah" was given out as an entry gift for those who watched the Cardfight!! Vanguard Movie, and is also included in the movie booster "Neon Messiah". - The English edition will be given with every display of the "Legion of Dragons & Blades ver.E" booster as a box topper. - This is an important card with vanguard's new ability, Stride. - The Deck have been renamed as Main Deck. - Above the Damage Zone is the Generation Zone. - Generation Zone consist of up to 8 G Unit(s) (maximum of 4 copies per card). - Players are allowed to use different sleeves from your Main Deck for cards in the Generation Zone. - Players are only allowed to browse through his or her own cards in the Generation Zone at all time. Meaning, the opposing player (opponent) is not allowed to browse your cards in the Generation Zone, especially those face down. - G Units cannot be put in your main deck. 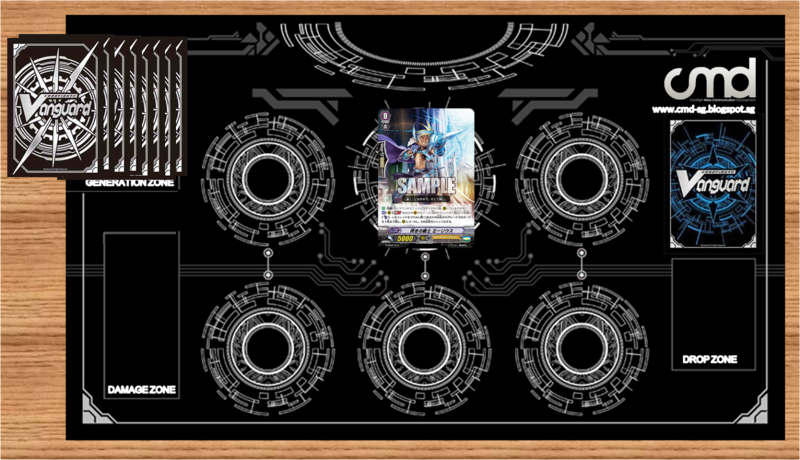 - Before the start of the fight, G Units, such as "Harmonics Messiah", are placed face down in a new zone on the playmat, the G Zone! - You can put up to 8 G Units in the G Zone! 1: Both players' vanguards are grade 3 or greater. 2: Discard 1 or more cards from your hand, with the sum of their grades being 3 or greater. 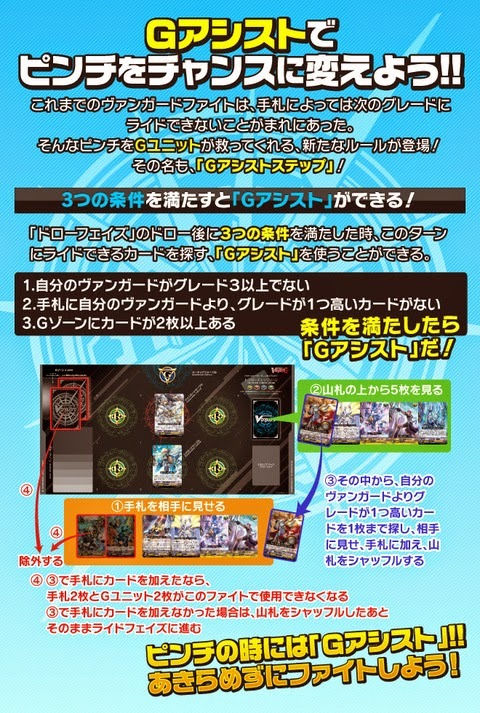 3: Choose a face down G Unit card in the G Zone, and Stride over your vanguard. - The "ride phase" will now be made up of 2 steps, the "ride step" and the "stride step", and it is during the "stride step" that you can stride! Use the new power of Stride as your trump card! - When a G Unit strides, it is placed on top of the original vanguard in a manner that allows the original vanguard's power and card name to be seen. The original vanguard becomes the "Heart", and the G Unit gains the [Power] and name of the "Heart"! However, the abilities of the "Heart" cannot be activated. 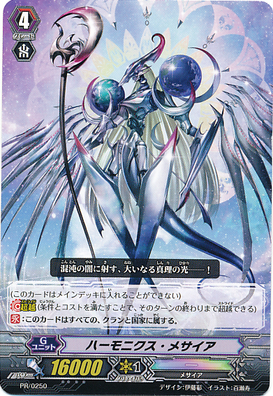 Example, the vanguard has both the card names "Harmonic Messiah" and "Light Source Seeker, Alfred Exiv", and its [Power] is 27000. - As it includes "Seeker", it will fulfill the requirement for abilities that reference "Seeker", such as that of "Full Bloom Seeker, Cerdic". - When you have a [Legion] vanguard, and you stride, place the G Unit on top of the 2 cards, and both of the units that are in [Legion] becomes the "Heart". 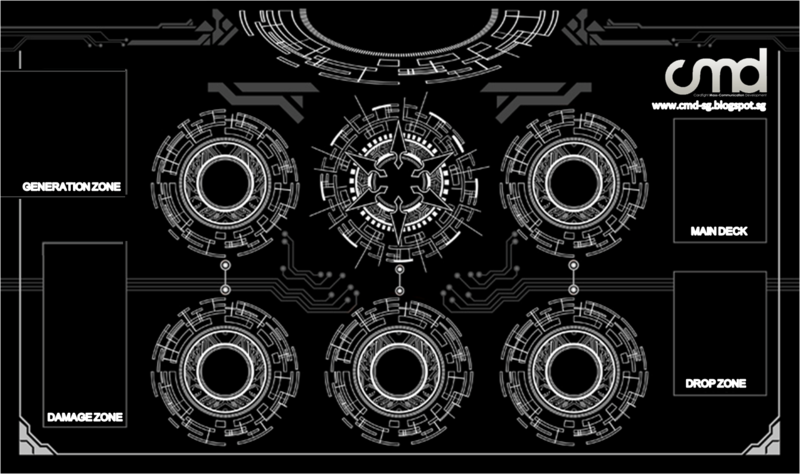 - However, choose 1 of the [Legion] units, and the G Unit only gains the [Power] and the name of that unit. Example, choose "Seeker, Thing Saver Dragon", [Power] is 16000 + 11000 = 27000. 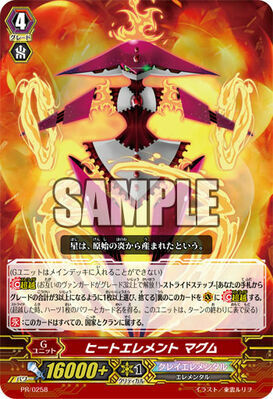 Name is "Harmonics Messiah" + "Seeker, Thing Saver Dragon", and NOT [Power] 16000 + 11000 + 9000 = 36000. - The skill icon below the grade is "Triple Drive!!". - As the name suggests, it is power skill that lets you perform 3 drive checks! - Return to the G Zone in face up at the end of turn. - A G Unit can only remain on the field during the turn that it strode. - It will return to the G Zone in face up at the end phase of the turn it strode. - The vanguard that was the "Heart", becomes the vanguard once more. - G Units that are face up in the G Zone cannot stride for the rest of the fight. "Harmonics Messiah" can be used in all decks!! 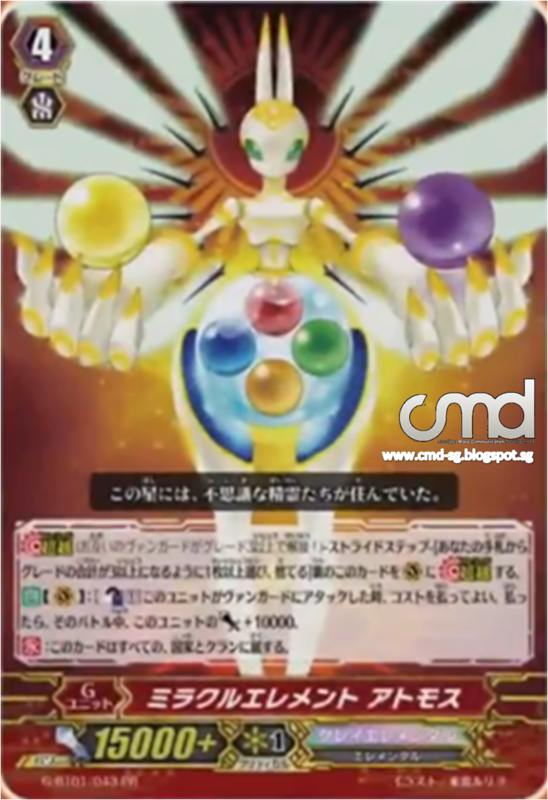 - "Harmonics Messiah" has an ability that says "This card is from all clans and nations.". In other words, it is a card that can be used in any deck, even when clan fight restrictions limit the clan. - Bushiroad hope that all vanguard fighters will try out stride. 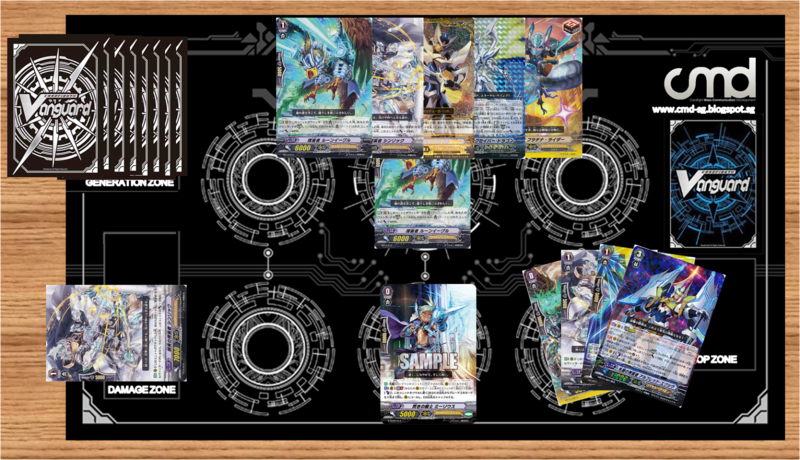 - It can be used in official Bushiroad tournaments for the Japanese edition from November 21 onwards! - Details for English edition tournaments will be revealed at a later date. Q1: Can I stride in the turn that I ride a grade 3? A1: Yes, you can. You can only ride once a turn, but stride is not ride, so as long as the conditions are met and you pay the cost, you can stride in the turn that you ride a grade 3. Q2: Can I stride when my vanguard is deleted? A2: Yes, you can. If you stride, the deleted vanguard is turned face up, and as it is the "Heart", the G Unit gains its [Power] and card name. Q3: What does it mean to discard cards from your hand, with their grades being 3 or greater? A3: It means you are to discard cards from your hand, such that the sum of their grades is 3 or greater. For example, discarding one grade 3, or discarding one grade 2 + one grade 1, or discarding three grade 1s. Q4: I stride when I have a [Legion] vanguard. What happens? A4: Place the G Unit on top of the 2 [Legion] units, choose one of those 2 units, and the G Unit gains the power and card name of that unit. Q5: I stride when my vanguard has a break ride ability. does the break ride ability activate? A5: No, it does not. As stride is not ride, it will not activate the break ride ability. Q6: Can I superior ride when I have a stridden vanguard? A6: Yes, you can. If you superior ride, the G Unit will be returned to the Generation Zone as face up. The vanguard that was the "Heart" goes into the soul of the unit that you had superior rode. Q7: Can I use a vanguard that is a "Heart" for a [Soul Blast] cost? A7: No, you cannot. A "Heart" is not in the soul, and thus, cannot be used for [Soul Blast] costs. Q8: How many cards does a stridden vanguard count as? A8: It counts as 1 card. Even if you strode over a [Legion] vanguard, it still counts as 1 card. Q9: At the end of the turn, when the "Heart" goes back to being the vanguard, does its "when placed on" abilities activate? A9: No, they do not. When a "Heart" becomes the vanguard, it is not being placed on [V]. Q10: I stride after I break ride. What happens to the [Power] +10000 and ability that my original vanguard had gained? A10: A card that becomes the "Heart" loses all abilities it had gained, as well as any changes to its [Power] from abilities. A G Unit only adds the [Power] and card name written on the "Heart" card. Q11: I stride when I have a legion vanguard. Is my vanguard considered as being [Legion]? A11: No, your vanguard is not considered as being [Legion]. Q12: I stride when I have a [Legion] vanguard, and the G Unit returns at the end of the turn. Is my vanguard considered as being [Legion]? A12: Yes. When it becomes the vanguard from being the "Heart", its state of being [Legion[ continues. "When you [Legion]" [Auto] abilities will not activate from this. Q13: How many G Units with the same name can I use? A13: You can use up to 4 G Unit cards with the same name. Q14: When the playmat is changed, do the old playmats become unusable? A14: No. Please communicate with your opponent, agree on areas to be the Guardian Zone, and fight as normal. Q15: Do cards in my Guardian Zone and cards in my main deck have to use the same sleeve design? A15: They do not necessarily have to use the same sleeve design. Please use sleeves as outlined in the Floor Rules. Also, please take care not to mix up the cards before the fight begins and during the fight. - Use G Assist to change a pinch into a chance!! - In vanguard fights up until now, there is a chance that you cannot ride to the next grade from hand. - A new rule that lets G Units save you from the pinch has arrived, and its name is the "G Assist Step"! - "G Assist" is a game method to prevent the player from missing the chance to ride to the next grade. Step 1: Reveal the cards in your hand to your opponent. Step 2: Look at five cards from the top of your deck. than your vanguard to your hand, and shuffle your deck. Step 4: Send 2 cards from your hand and 2 cards from your G zone out of the game (This is not bind nor discard). shuffle your deck and proceed to ride phase. - When 3 conditions are fulfilled, you can "G Assist"! - Your current vanguard must not be grade 3 or greater. - You must not have any card in your hand with 1 grade greater than your vanguard. - You must have 2 or more cards in your Generation Zone. - If the conditions are fulfilled, then "G Assists"! Step 3: From among them, add up to one card with 1 grade greater than your vanguard to your hand, and shuffle your deck. Note: In the case where you did not add any card to your hand during the step 3, shuffle your deck and proceed to ride phase. - Use "G Assist" when in a pinch!! Don't give up and fight on! Note: All CMD Image Examples are prepared by CMD (Singapore).